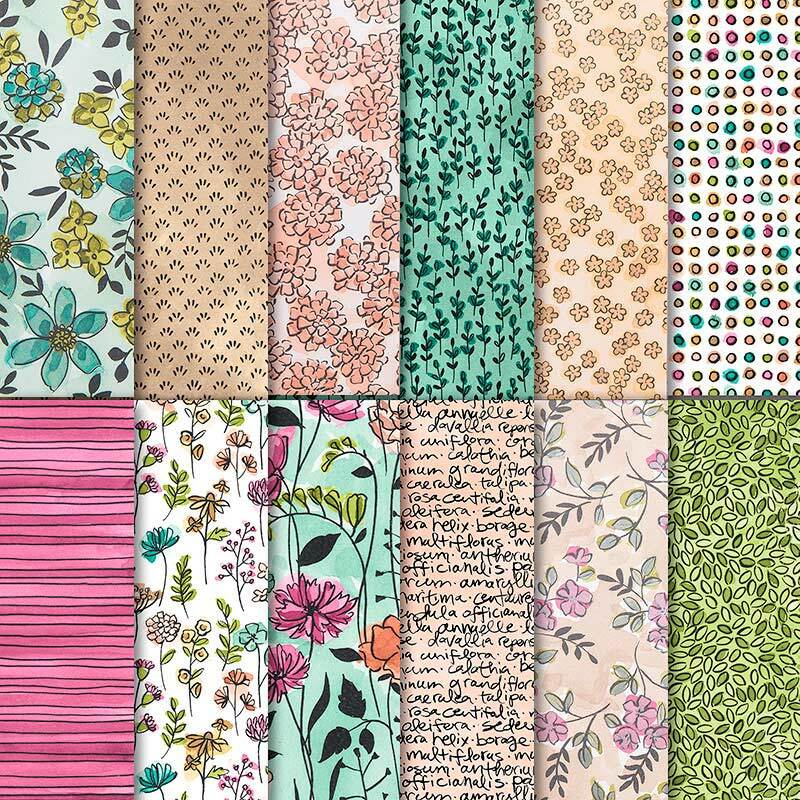 Welcome to the June Paper Pumpkin Blog Hop featuring amazing projects created with the Broadway Star kit that coordinates perfectly with the Broadway Bound Suite in the New 2018-2019 Annual Catalog. You may have just come from Lisa's blog or perhaps you are starting your journey with me. I hope that you will enjoy our projects and that they will inspire you to create your own alternate projects with this month's kit. 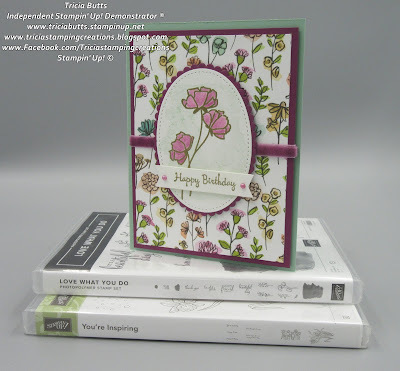 Today I am sharing with you a pocket card that I created using supplies from the Broadway Star Paper Pumpkin kit and the Broadway Birthday stamp set (item #147067) from the new Annual Catalog. 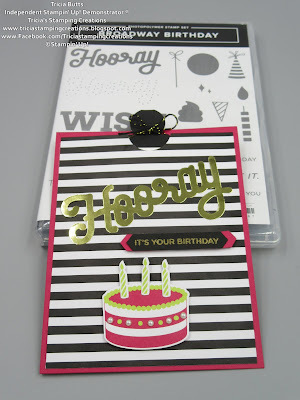 I used one of the black and white striped card bases from the kit and cut a 5 1/4" x 4" piece. Using Tear & Tape Adhesive, I applied the tape to the sides and bottom of the back of the striped cardstock and adhered it to a piece of Lovely Lipstick cardstock cut to 5 1/2" x 4 1/4". For the insert of the card, I cut a piece of Whisper White cardstock to slide inside the pocket (4 7/8" x 3 3/8"). 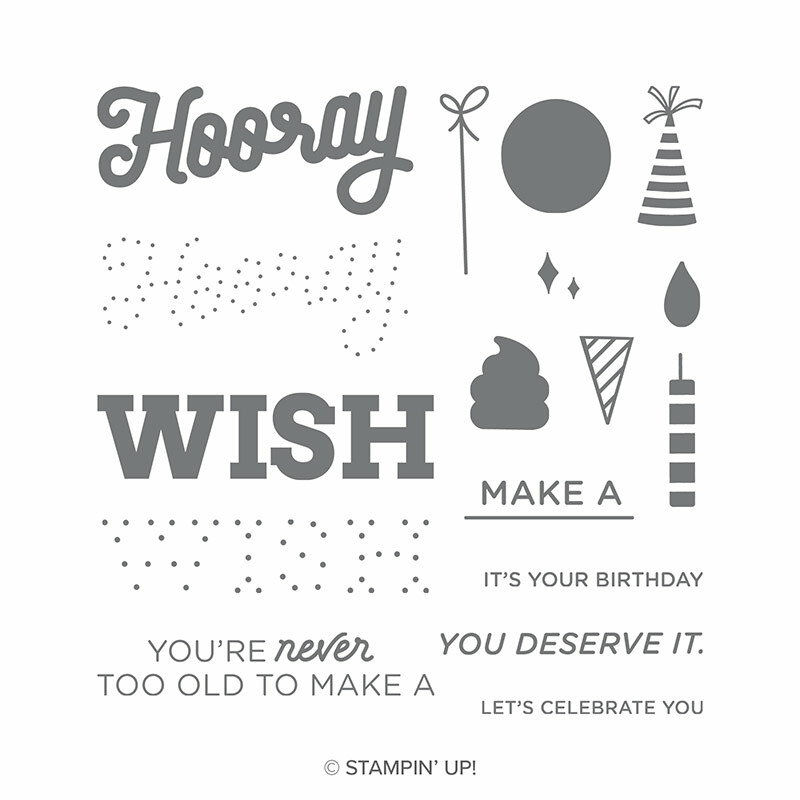 Using Lovely Lipstick Embossing powder, I heat embossed the Wish sentiment from the Broadway Birthday stamp set onto the Whisper White cardstock and stamped the Make A sentiment with Memento Tuxedo Black ink. 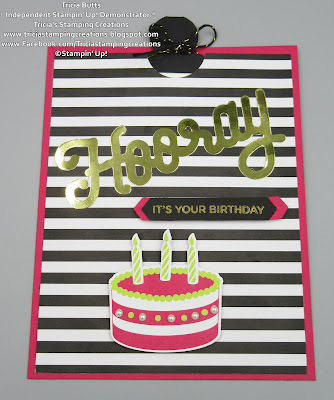 To create the tab at the top, I used the Circle Tab Punch to punch out the tab from Basic Black cardstock. Folding the tab in half, I attached it to the top of the Whisper White cardstock with Snail Adhesive and tied a bow using the Black & Gold Twine included in the kit. To decorate the front of the card, I used the die cuts included in the kit, including the Gold Foil Hooray and the birthday cake and candles. I attached the cake using Stampin' Dimensionals to provide extra dimension. 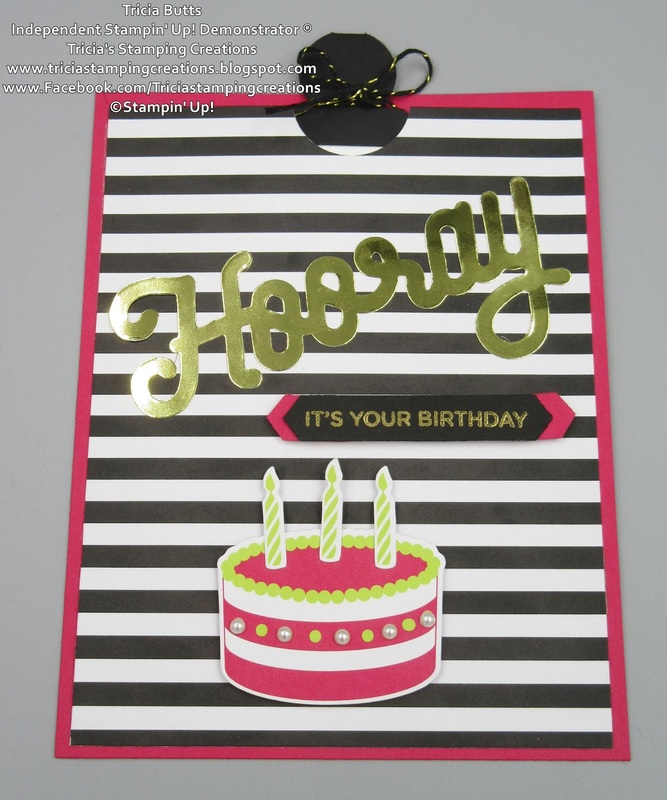 The smaller sentiment from the Broadway Birthday stamp set has been heat embossed using Gold embossing powder onto Black cardstock and I punched it out using the Classic Label Punch. I used the Classic Label Punch to also punch out another shape from Lovely Lipstick cardstock, cut it in half and then attached it to the back of the sentiment with Snail Adhesive. 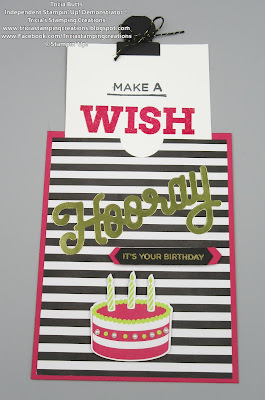 I attached the sentiment to the card using Mini Stampin' Dimensionals. 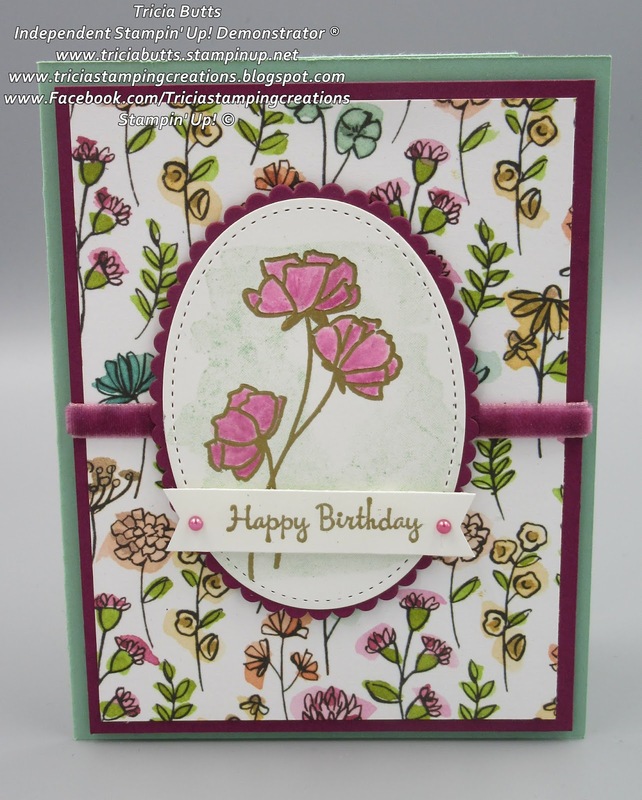 To finish off the card, I added some of the Mini Pearls included in the kit to embellish the birthday cake. This fun card design is a great way to step up the supplies in your kit and the Broadway Birthday stamp set from the Broadway Bound Suite, coordinates perfectly to provide you with additional options. 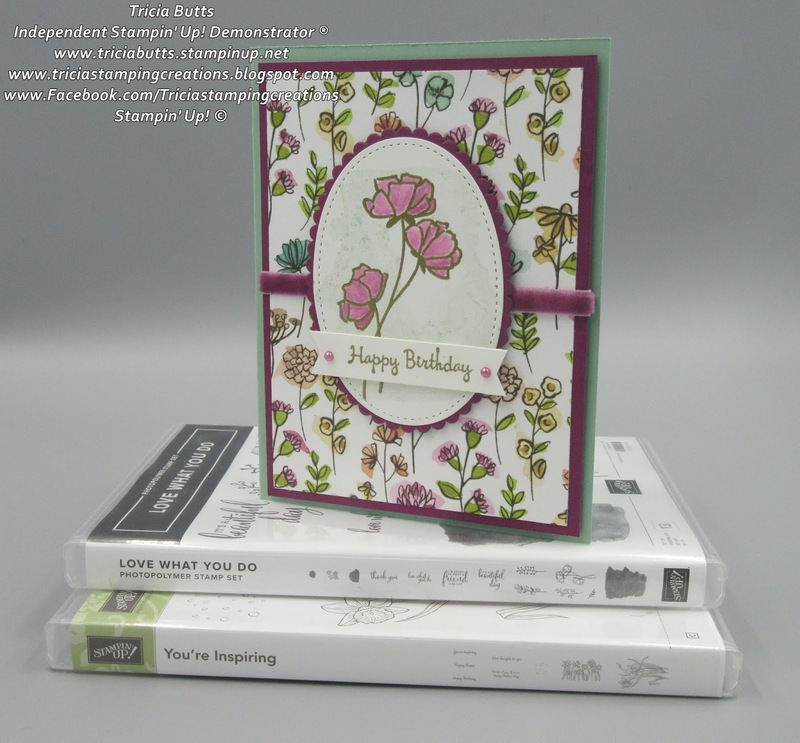 I hope you have enjoyed my alternate project for the June kit and I hope that it will help inspire your explore your own creations with the supplies in this kit and the new Broadway Bound Suite. 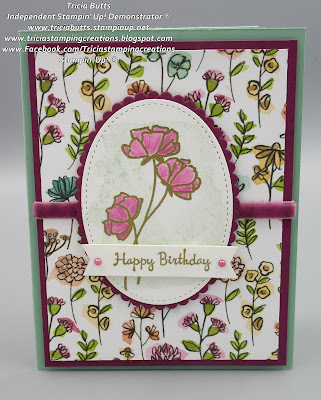 Now it's time to visit Deb's blog and see what amazing projects she has created with this month's kit. Just click the Next button below to visit her blog. 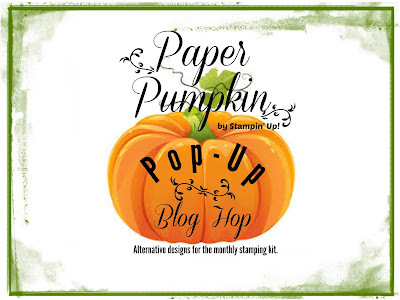 I hope that you will enjoy the rest of this blog hop. Please leave us a comment to let us know what you enjoyed about our projects. We appreciate your feedback. 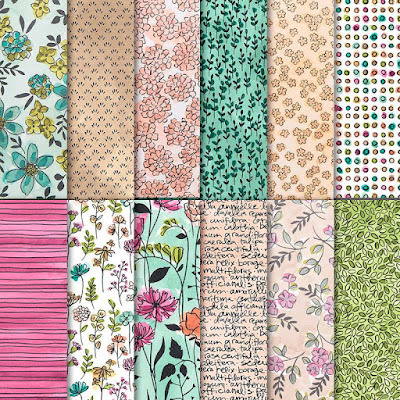 Labels: 2018-2019 Annual Catalog, Broadway Birthday stamp set, Broadway Bound Suite, Broadway Star, June Paper Pumpkin, Stampin' Up! Welcome to the first Home Décor SU Style Blog Hop, featuring 20 amazing Stampin' Up! 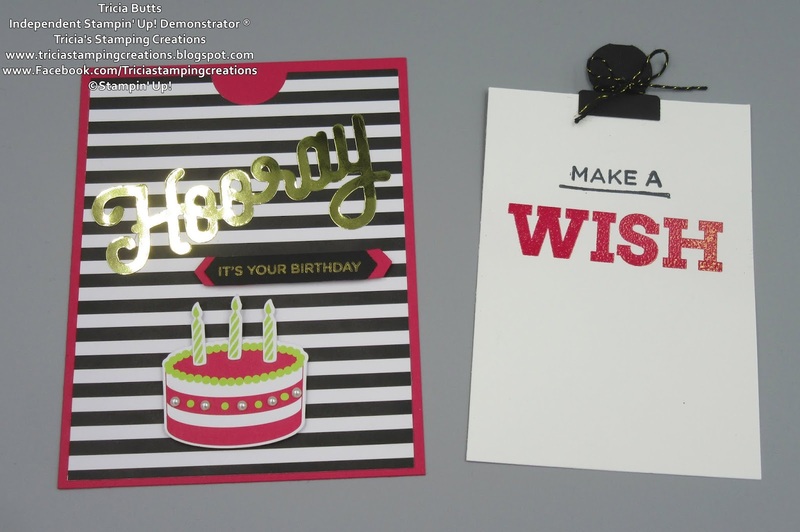 demonstrators sharing their creative projects to help inspire you. 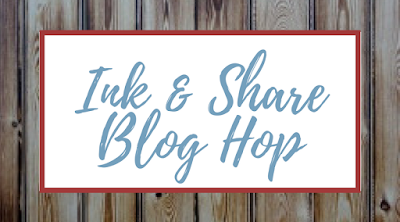 You may have just visited Kim Oliver's blog or perhaps you are starting your blog hop journey here. I hope that you will enjoy what we have to share. 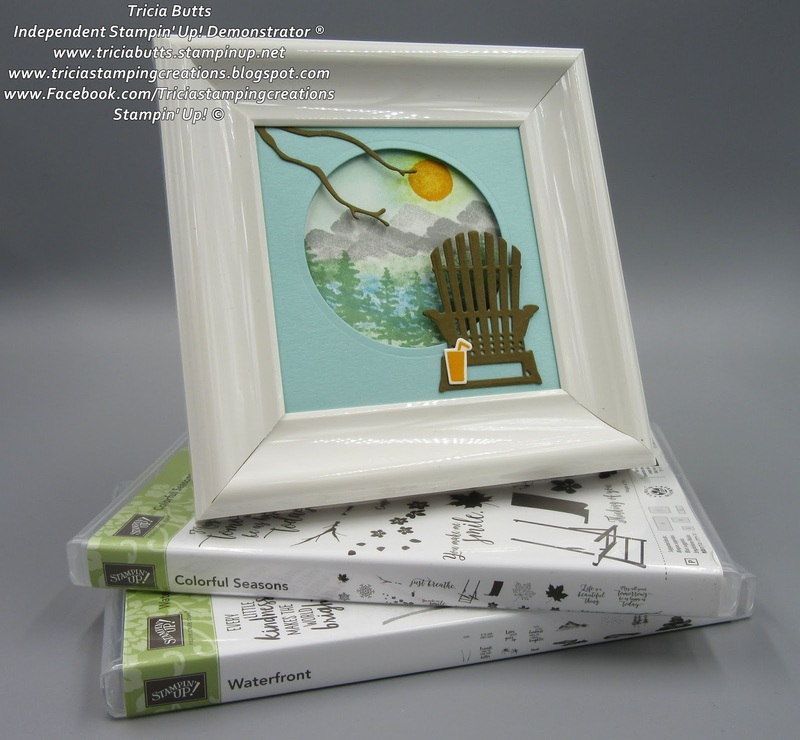 Creating framed artwork can help you decorate your home or work place and I chose a small, simple frame to showcase my project. I love to add depth and texture to my projects so I chose to use the Colorful Seasons stamp set and coordinating Seasonal Layers Thinlets dies to accent the scenery I created using the Waterfront stamp set. Living in Colorado, I am blessed to enjoy the view of the Rocky Mountains every day, so I was inspired to create a mountain landscape. 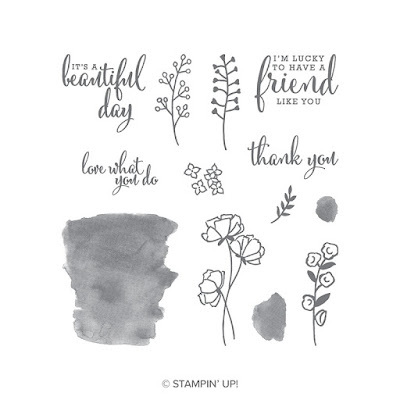 The Waterfront stamp set has a wonderful assortment of images to help you create a wide variety of scenes. 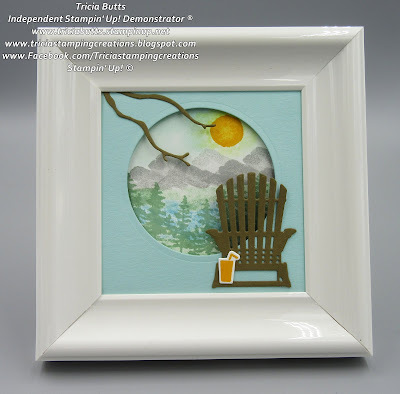 I die cut a circle out of a piece of Pool Party cardstock to create a matte for my landscape and used Stampin' Dimensionals to create depth and dimension. To finish off my framed artwork, I added a chair and branch and drink die cut with the Seasonal Layers Thinlets dies to the matte. I liked the feeling that you could sit in the chair and enjoy the view after a long day. My father has spent time in hospital recently and I thought that having a frame like this in his hospital room would help provide a cheerful alternative to looking at the walls of his room. Thankfully he is back home and recovering but his recent experience inspired me to create this frame. I hope that my project may inspire you to create your own framed art for someone special in your life. 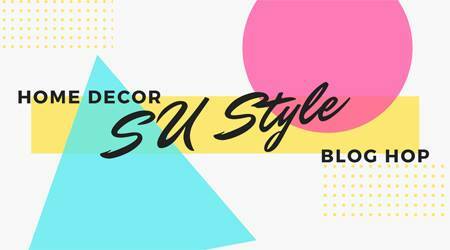 Now it's time to visit Sara Levin's blog and see what she has to share with you today. Please use the blog hop list below to visit all the wonderful blogs in today's blog hop. We would love it if you would leave us a comment and let us know what you enjoyed about our projects. Your feedback is appreciated.